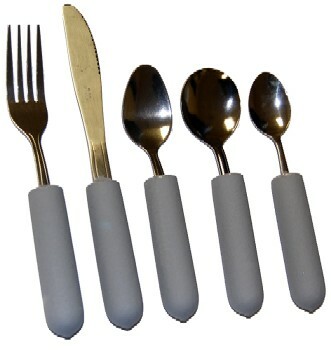 Weight has been added to these adaptive utensils to assist in stabilizing hand tremors and allowing your child to feed him/herself. 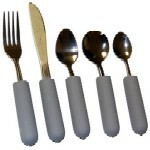 The weighted utensils are available in either straight or angled versions. The left or right angled uttensils are shaped to turn in toward the center of the body. Each utensil weighs approximately 4 ounces. Youth Spoon - straight, right or left angled. This spoon has a smaller bowl than the teaspoon. 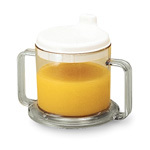 The Transparent Mug with Drinking Spout is a two-handled, high-strength, clear plastic mug with an extra-wide base for stability.